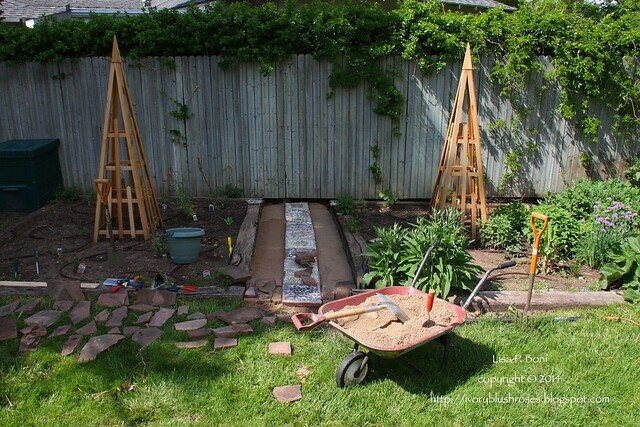 One of the many projects on my to-do-list, was to create a better path between the two garden beds. It tended to get muddy and weedy and by the end of summer isn't very nice to look at. Today's job was to get it underway and hopefully finished. We started by removing all the weeds and leveling the ground. Then I laid ground cloth over the path and pinned it down. Next came a layer of sand that ranges from 1 to 2 inches deep, which was leveled and then packed down. One of the previous owners of this house had made many mosaic covered pavers and placed them all over the yard. We gathered them all together and lined them up down the center of the path. I'm not sure how they will hold up to foot traffic in the garden, but they will be enjoyed while they last. Before we had the tree stump and miscellaneous shrubs removed, we gathered a good sized pile of loose flagstone pieces that had made a loose wall around some old flower beds. We are using them to fill in the sides of the path around the mosaic pavers. We think the flagstone goes back to the original owners of the house as it was a feature in many of the houses in this neighborhood that were built around the same time. I'm really happy with how it's coming out! We got 95% finished when our work was stopped by a thunderstorm overhead. I snapped a few quick photos before the rain started in earnest! 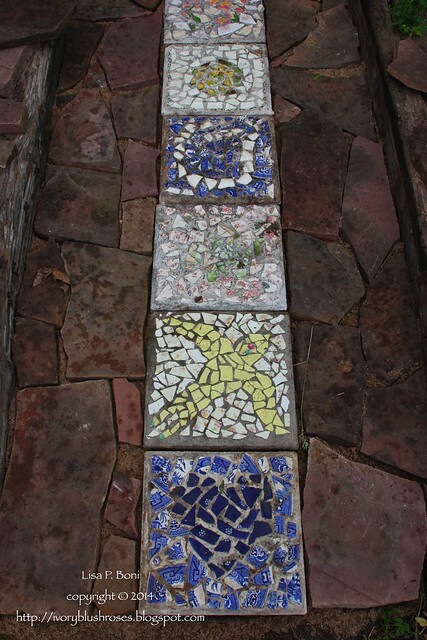 Here's a look at some of the mosaic pavers. They all use bits of broken china. Some are in pretty good shape, while the ones at the back of the path, where we figure they will get less wear and tear, are in a bit rougher condition. It's fun to see them all together and to have this path that pays tribute to previous owners, who I think must have loved this house as much as I do! This is a shot of the working scene. We laid out all the pieces of flagstone on the lawn so I could see the shapes. Piecing the path together is a lot like piecing a jigsaw puzzle! We should be able to get it finished tomorrow morning. We'll sweep some sand into the cracks between the flagstones. It should be fairly easy to redo if we need to, but in the meantime adds a delightful touch to my flower garden, which is coming along, slowly but surely! 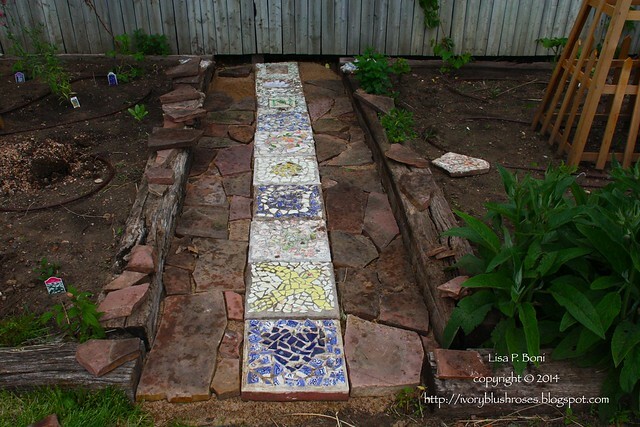 I love this, Lisa, the paving between the garden beds, using the previous owners mosaics. It's all going to look so lovely. WOW, what a wonderful path. The mosaics are really lovely. I have followed your blog for a couple of years and now hear in your writing the joy you feel creating your new found space. It occurs to me now it was love at first sight. Thank you so much for sharing the loving touches with which you are blessing your new home. That's a lovely path you've created. 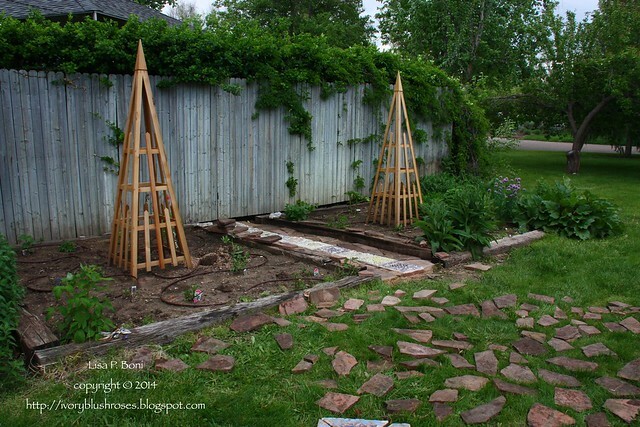 It's nice to incorporate items from the previous owners into your new gardens. that looks lovely and such a nice tribute to previous owners!